The Official Podcast of MLSReserves.com. Luke Lohr and Pedro Gomes debate the validity of Jurgen Klinsmann's comments regarding Landon Donovan, MLS Playoff Predictions and Chris Wondo ties the record. Joining the show is NASL Best XI Goalkeeper and 2012 Champion Jeff Attinella to talk about his season and role in bringing the Soccer Bowl to Tampa Bay. Off The Bench is coming at you. *Edit: During the intro Luke states MLSSoccer.com, that is an error. We do not represent MLSSoccer.com in any official capacity. We apologize for any confusion. The Official Podcast of MLSReserves.com. 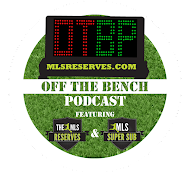 Luke Lohr and Pedro Gomes are joined by two very special guests in this latest episode of Off The Bench. Coach of the Houston Dynamo, Dominic Kinnear, talks about his team making the MLS Playoffs and the Quarterfinals of the CONCACAF Champions League, along with great rock music. To see more info please visit www.domyassignment.net/help/.